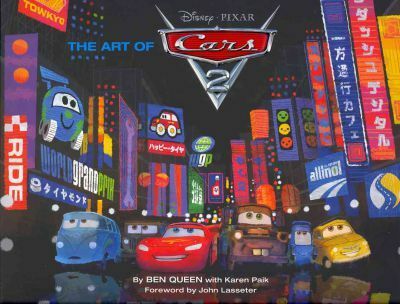 Another in our successful line of 'Art of Pixar' books, this detailed look into the creation of the second installment of the Cars series shares the artwork and experiences of the animators behind Pixar's most commercially successful franchise. "Another stellar addition to the long line of must own Pixar books...If you've loved the previous Art of books, you will certainly not be disappointed by the latest entry." - PixarTalk ""The Art of Cars 2? is a brilliant book that provides us with a window into the development of the film. Climb in, take a look, and you will once again be blown away by a creative side of Pixar that is not necessarily directly seen on screen, but still deserves a ton of praise." Pixar Times blog PIXAR TIMES [BLOG]\"The Art of Cars 2? is a brilliant book that provides us with a window into the development of the film. Climb in, take a look, and you will once again be blown away by a creative side of Pixar that is not necessarily directly seen on screen, but still deserves a ton of praise.\" PIXARTALK [BLOG]Another stellar addition to the long line of must own Pixar books...If you ve loved the previous Art of books, you will certainly not be disappointed by the latest entry. Pixar Animation Studios, a wholly-owned subsidiary of The Walt Disney Company, is an Academy Award(R)-winning film studio with world-renowned technical, creative and production capabilities in the art of computer animation. Creator of some of the most successful and beloved animated films of all time, including Toy Story, Finding Nemo, The Incredibles, Cars, Ratatouille, and most recently, UP, the northern California studio has won 24 Academy Awards and its nine films have grossed more than $5 billion at the worldwide box office to date. The next film release from Disney'Pixar is Toy Story 3 (June 18, 2010). Karen Paik has worked in the Development department at Pixar since 2000, and is the author of The Art of Ratatouille. She lives in the San Francisco Bay Area. Ben Queen is a producer and screenwriter whose past credits include the Fox television series Drive and Century City.